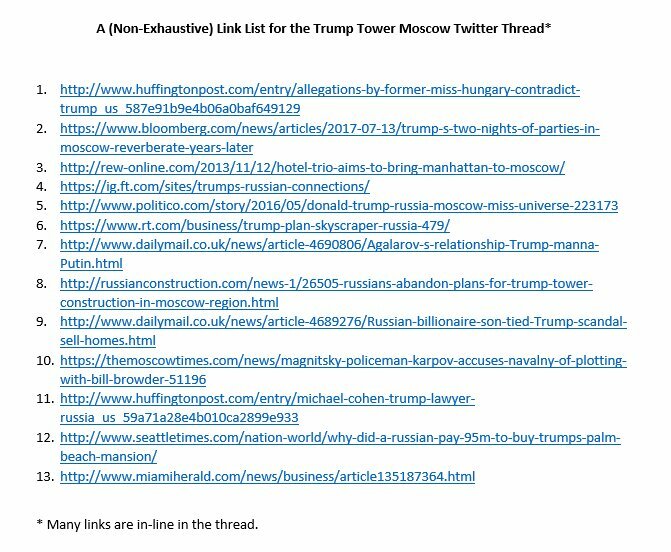 Thread by @SethAbramson: "(THREAD) Trump Tower Moscow sits at the heart the Trump-Russia scandal. This thread reveals the REAL story behind it. Please share widely. 1 […]"
(THREAD) Trump Tower Moscow sits at the heart the Trump-Russia scandal. This thread reveals the REAL story behind it. Please share widely. 2/ In announcing the project's end, Russian media confirmed that the project had begun in 2013, and that there was only ever ONE project. 3/ Agalarov did NOT announce the end of the project in June 2015, when Trump announced his candidacy for President of the United States. 4/ Nor could he have done so, as we now know, from Washington Post reporting, that the project was alive and active in both 2015 and 2016. 5/ Just to underscore this: Trump was working on a real estate deal with a KNOWN Kremlin agent for SEVEN MONTHS while running for president. 6/ And Agalarov didn't claim the project had died simply because Trump had been elected president—but because Trump "couldn't do any deals." 7/ Recall that—by Trump's own public admission—as late as Election Day he did not believe he would win the presidency of the United States. 8/ Trump thought that—on November 9, 2016—he'd return to being a non-politician private citizen free to do big international business deals. 9/ So all of Trump's historically pro-Russia foreign policy was developed at a time he thought he was making a pitch for Trump Tower Moscow. 10/ To reverse his policy positions in office would be to admit that they'd not been formulated with U.S. interests in mind—a sad catch-22. 11/ Recall now that—when he DID win on November 8—Trump for weeks resisted ANY attempt to shut down his business dealings at home or abroad. 12/ He STILL hasn't divested himself of his business interests in conformance with our Constitution, precedent, or federal ethics watchdogs. 13/ So Agalarov waiting 85 DAYS after Trump's election as president to announce the end of the Trump Tower Moscow project is no coincidence. 14/ Let's first understand who Aras Agalarov is—as it's clear Trump knew EXACTLY who/what he was when he entered into business with him. 15/ UK media calls Agalarov a "Kremlin insider" who is "Putin's main property developer" and the primary "liaison between Putin and Trump." 16/ He's been called "Putin's right-hand man when it comes to carrying out development projects." Putin is reportedly very "fond" of him. 18/ Agalarov has admitted to Russian media that he takes "orders" from Putin, completing big development projects—without tenders—on demand. 19/ By every *possible* legal definition of the term, Agalarov is not just a Kremlin agent but, even more specifically, an "agent of Putin." 20/ Agalarov is professionally a creature of Putin; he enjoys Putin's largesse. The chances he'd act counter to Putin's interests are zero. 21/ Doubt this? Consider that Putin awarded Agalarov Russia's "Order of Honour"—one of the highest honors any Russian civilian can receive. 22/ Consider, too, that Agalarov received this honor—Putin's clearest-possible imprimatur—TEN DAYS before Trump went into business with him. 23/ The Steele Dossier—MI6-derived work-product that the FBI probe into Trump-Russia ties relies upon—mentions Agalarov, though not by name. 24/ The Dossier details Russian efforts to entice Trump toward pro-Russia policies using promises of future MAJOR Russian development deals. 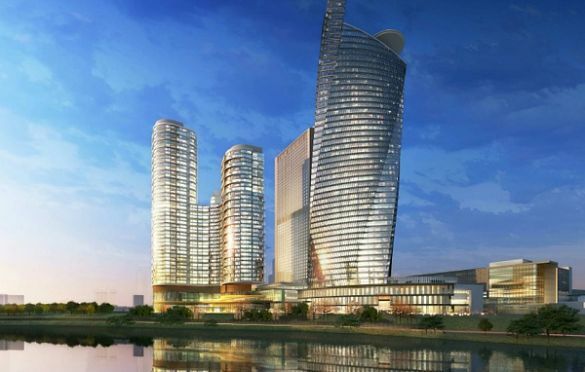 25/ Several such deals noted by the Dossier involve 2018 World Cup real estate projects. And Putin put AGALAROV in charge of those projects. 26/ So the Dossier that *forms the basis of the FBI's Russia probe* alleges Putin is using Agalarov to influence Trump. And that checks out. 27/ Agalarov has been DRAMATICALLY influencing Trump's actions since they met in June 2013, two years BEFORE Trump announced his candidacy. 28/ Don't fall for Team Trump's trick of acting like Trump decided to run for president on the *day he announced*. He decided in *mid-2013*. 29/ The Agalarov-Trump partnership began in June 2013, 18 months before Trump's announcement—and while he was *aggressively* considering it. 30/ Indeed, The New York Post announced Trump was exploring a run for president one month BEFORE Trump met Aras Agalarov in June 2013. 32/ Trump's May 2013 expenditures studied ALL FIFTY STATES to determine Trump's popularity in each—and Trump's attorney said he was SERIOUS. 33/ Michael Cohen: "We didn't spend $1 million on this research for it to sit on my bookshelf....Trump is exactly what this country needs." 34/ In the past, Trump has teased presidential runs either to boost his business standing or because he was serious about the possibility. 35/ So either Trump was keen to suddenly raise his business profile in May 2013 or he was engaging in a long prelude to a presidential run. 36/ Besides planning a possible 2016 presidential run, Trump spent May 2013 trying to decide where to hold the 2013 Miss Universe pageant. 37/ According to Trump, almost twenty nations around the world spent May 2013 frantically vying for the honor of hosting Miss Universe 2013. 38/ And yet, within ONE WEEK of meeting Agalarov for the FIRST TIME in June 2013, Trump awarded that year’s Miss Universe pageant to Russia. 39/ Reportedly, Trump and Agalarov quickly became SO close from June 2013 on it was like "manna"—God-granted nourishment—to Vladimir Putin. 40/ A western diplomat in Moscow has gone much further: "If there are skeletons in Trump's dealings with Russia, Aras knows where they are." 42/ "And if Aras Agalarov knows Donald Trump's skeletons, you wouldn't bet on Vladimir Putin not ALSO knowing," added the Western diplomat. 43/ It's clear that "Trump Tower Moscow" was born sometime between June 2013 and the 2013 pageant—but likely *at* that June "first meeting." 44/ We know this because Trump Tower Moscow was announced by RT, Russia's Kremlin-run media outlet, on November 9th—the day of the pageant. 45/ Syncing announcement of the project and Trump's arrival in Moscow underscores that its broad strokes—at a minimum—had come much earlier. 46/ So U.S. media should be reporting Trump was negotiating with a known Kremlin agent at the same time he was exploring a presidential run. 47/ And that means Trump's development of a Russia policy—and him doing so with an eye toward business gains—began in the Spring of 2013. 48/ It also means that the efforts by Trump ally DeSantis in the House to preclude Mueller investigating anything pre-2015 is *Obstruction*. 49/ So how did the Agalarovs first sidle up to Trump? The plot involves a music video, a supermodel, and a Euro-pop musician: Emin Agalarov. 50/ Emin (Aras' son) cast Miss Universe 2012 Olivia Culpo in a video of his—which led to her and a Miss Universe delegation going to Moscow. 52/ Several Senators have asked Congress to investigate "Trump Tower Baku"—a deal which involved the most corrupt businessmen in Azerbaijan. 53/ So when Trump met Aras and Emin in June 2013 they were implicitly able to help Trump realize TWO dream deals: towers in Moscow AND Baku. 54/ This explains why—in June 2013—it took Trump UNDER A WEEK to throw over 16 OTHER NATIONS and award his pageant to Aras, Emin, and Putin. 55/ The pageant was scheduled for the SAME DEVELOPMENT Trump Tower Moscow was later announced for—suggesting the TWO conversations were ONE. 56/ Indeed, Trump's pageant release was bizarre: “A big deal that'll bring our countries together!” he wrote—possibly of Trump Tower Moscow. 57/ He added, "Moscow right now is a very important place—we wanted Moscow all the way. One of the great families in Russia is our partner." 58/ So Trump's excitement was tied first and foremost to building new ties between himself and Moscow, Russia, and a "great Russian family." 59/ We know Trump quickly invited Putin, confirming this would be—amid Trump's presidential exploratory phase—a Trump-Putin political event. 60/ Indeed, what occurred in the second week of November 2013 in Moscow was nothing short of a colossal, well-prepared Trump-Kremlin summit. 61/ As Aras and Trump had already discussed a Trump Tower Moscow deal finally getting hatched out in Moscow, Trump went to Moscow PREPARED. 62/ He brought with him Alex Sapir and Rotem Rosen, two New York-based Russian developers who'd previously worked with Trump on Trump Soho. 63/ Sapir and Rosen would later say, "Russians from the oil and gas businesses had long been asking to be partners [in Trump Tower Moscow]." 64/ So, WELL PRIOR to November 2013, Trump's Russian business partners told him Russians in the oil/gas industries wanted to give him money. 65/ This is a good time to note Trump has—since November 2013—categorically refused to say which Russians he met during the Moscow pageant. 66/ And as you read that last tweet, please remember that Trump's famous for bragging about who he's met—even people he HASN'T actually met. 67/ Read Tweet #64, then this: Steele's dossier alleges Trump's Russia policy is based on Russians in oil and gas wanting to give him money. 68/ Trump would later say THIS about the (Trump-orchestrated) attendance at his Moscow pageant: "Almost all Russia's oligarchs were there." 69/ Trump would add, as if to underscore his obsession with pandering to these "Russian oligarchs": "The Russian market is attracted to me." 72/ "There is no evidence such talk led anywhere, however—perhaps because Trump soon turned his attention to his run for the White House." 73/ This "no evidence" line—coupled with the idea that Trump's attention WASN'T on the White House in November 2013—has obscured the TRUTH. 74/ 2013 was a continuation of a more-than-decade-long trend: Trump using the Miss Universe pageant to advance unrelated business interests. 75/ It wasn't even the first time he'd used the pageant to advance his RUSSIAN business interests—or even the first time PUTIN was involved. 77/ Some of the confusion over Trump's 2013 Moscow pageant has been caused by the fact that—despite Trump inviting him—Putin DIDN'T SHOW UP. 78/ Trump tweeting publicly—before the pageant—that he expected Putin to be at the pageant and become his "new best friend" has misled us. 79/ In fact, Putin *wasn't*, actually, the person Trump needed to be at Crocus City Hall on November 9, 2013 to get Trump Tower Moscow done. 80/ As Don Jr. told investors in 2008, the Trump Org's failures to get their biggest Russia designs off the ground had to do with *permits*. 81/ Don Jr. and Michael Cohen—Trump's point men—have publicly acknowledged the fact that nothing is built in Moscow without Putin's say-so. 82/ But that "say-so" wasn't literal—Putin didn't have to shake your hand. He had a guy to do that—and in 2013 his name was VLADIMIR KOZHIN. 83/ Per UK media, Putin didn't show up to the pageant because he was worried about how it would look. Why? Remember the New York Post story. 84/ Everyone "in the know" in politics in May and June 2013—and certainly by November 2013—believed Trump was planning to run for president. 85/ If Putin hob-knobbed with Trump on TV, he'd secure Trump's BUSINESS, while damaging him severely—maybe permanently—as a POLITICAL ASSET. 86/ But Putin KNEW what Trump wanted out of the Moscow pageant, as ARAS AGALAROV—awarded the Order of Honor by Putin just days earlier—knew. 87/ So guess who Putin sent to the pageant as his replacement, with apologies and a (second) gift for Trump? That's right: VLADIMIR KOZHIN. 88/ Media reports confirm Trump had business meetings throughout his Russia trip in 2013, and we now know some of those he was meeting with. 89/ Trump met with Putin's "property chief"—the guy who says if you can build in Moscow or not—and Putin's real estate developer, Agalarov. 90/ He met with his Russian developer friends, who'd publicly claimed to have Russian oil-and-gas investors lined up for Trump Tower Moscow. 91/ In other words he had the developer, the permits and the money in one place—and that's how TRUMP TOWER MOSCOW was born November 9, 2013. 93/ "...UNITED STATES MUST BE VERY SMART AND VERY STRATEGIC." Once again, Trump combined his business and his political rhetoric seamlessly. 94/ Trump also had a public Twitter message for the Agalarovs: “I had a great weekend with you and your family. TRUMP TOWER MOSCOW is next." 95/ So let's have an ADULT CONVERSATION about Trump's lost weekend in Moscow in November of 2013. Was it salacious? Yes. But let's be adult. 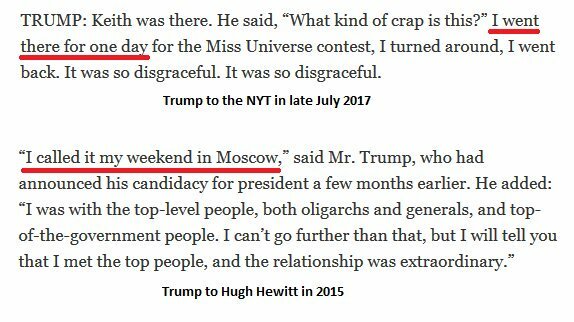 96/ It's important to understand, first, that Trump's November 2013 weekend in Moscow was a CELEBRATION—the culmination of DECADES of work. 97/ Trump and Aras Agalarov have both PUBLICLY confirmed that the agreement to build Trump Tower Moscow was sealed during the 2013 pageant. 98/ What this meant was—after decades of *unsuccessful* business ventures in Moscow—Trump had a PUTIN-APPROVED DEAL to build a tower there. 99/ For all the Russian money Don Jr. had bragged about Trump Org getting in 2008 he was still—even then—complaining about permits to build. 100/ So the "salacious" night that U.S. media won't even discuss was likely the best night of our current President's ENTIRE BUSINESS LIFE. 102/ And why not? At Nobu Moscow, he'd met a dozen Russian CEOs and oligarchs, including the head of state-owned Sberbank—and it PAID OFF. 104/ Bloomberg says the Sberbank CEO Trump dined with is "a longtime ally of President Vladimir Putin." Putin got Trump a $2.4 BILLION DEAL. 105/ So Trump didn't meet Putin, but Putin ORCHESTRATED possibly *the most exhilarating and lucrative business weekend* of Trump's life. 106/ And that *may* be why *every* statement both TRUMP and AGALAROV have made about this entire weekend in 2013 has turned out to be a lie. 108/ Trump afterward told REW—which noted Trump Tower Moscow would be Trump's "first Russia project"—he was looking at multiple developers. 110/ Aras claimed not to know his son's manager, Rob Goldstone—though Goldstone spent that 2013 Moscow weekend partying with Trump and Aras. 111/ Emin claimed Trump *couldn't* have had a wild night at the Ritz, as he filmed a video at 7AM the next day. Trump says he never sleeps. 112/ Moreover, the post-pageant after-party *started* at 1AM at a Moscow club—so there's no evidence Trump would've slept that night at all. 113/ Of course, even the order of events has been made confusing: Emin's video was 7AM the day of the pageant, the 1AM after-party later on. 114/ Even Aras concedes Trump was in the Ritz presidential suite *for at least two nights*—not the *one* that Emin's lie seeks to establish. 116/ One thing we know for sure: Trump intended to continue partying *after* the after-party that followed the pageant (early AM, 11/10). 117/ We know this because, before Steele's dossier was ever released, 2013 Miss Hungary Kata Sarka *told us so*—not knowing it would matter. 118/ Sarka said—but only when asked—that the night of November 9, 2013, Trump propositioned her for an adulterous affair in his hotel room. 119/ Trump—married to Melania but not traveling with her—appeared to want to celebrate the best day of his life with an affair with a model. 120/ Trump is notorious for sleeping with, and trying to sleep with, pageant contestants, so this allegation is actually not too surprising. 121/ What different in this case is that Sarka's account *confirms* the biggest lie Trump told about his weekend in Moscow in November 2013. 123/ Trump says he knew there were cameras and audio recording equipment in his room—so he wouldn't have done anything untoward while there. 125/ So like Agalarov, Trump has lied about the length of his trip, what he did while there, *and* the manner in which he comported himself. 127/ Trump calls the dossier sick, saying its existence suggests "we're living in Nazi Germany"—thus comparing himself to Holocaust victims. 128/ He says (rather incredibly) that the fact that he is a germophobe means he would be unable to *watch* a third party urinate onto a bed. 129/ The CIA says this: "There is more than one tape, audio and video, from more than one date, in more than one place, of a sexual nature." 130/ The CIA went on to tell the BBC that one of the videos comes from the Moscow Ritz, from November 2013, the other from Saint Petersburg. 131/ The CIA said other intel agencies had the same intel. And the dossier said multiple sources—Agalarov being one—could confirm the tapes. 132/ So in the same 24 hours Putin gave Trump the biggest win of his business career—his first Russia deal—he snared Trump's future loyalty. 133/ Now Trump's 2013 deal is treated as dead, rather than on hold, and Putin's largesse irrelevant, not something Trump would never forget. 134/ But all Trump's Russia policies were developed while the deal was live, and Aras ONLY killed it THREE MONTHS into Trump's presidency. 135/ The message—whether Putin plans to use his tapes or not—is clear: Trump WILL get BACK his big win—Trump Tower Moscow—IF he acts right. 136/ In the meantime Trump's one-time personal lawyer and one-time point man on Russia projects—Michael Cohen—is trying to muddy the waters. 138/ Cohen says Trump pal Felix Sater initiated a Trump Tower Moscow deal in late 2015 by saying he'd find an (unnamed) Russia developer. 139/ In fact there's NO EVIDENCE that, in late '15, the '13 Trump-Putin deal wasn't just on hold—with Putin withholding permits as leverage. 140/ This is why, in emails to Cohen, Sater promises to get Putin on board—as what was needed was for the deal to be RESTARTED, not started. 141/ Sater underscores, though, that Putin's re-initiated support for Trump Tower Moscow (via permits) depends on Trump becoming president. 142/ This is what Sater meant in writing Cohen, "Our boy Trump can become President of the United States of America and we can engineer it." 143/ Sater—who Putin sent to whisk Trump out of bankruptcy in 2002, after Trump made Putin's girlfriend Miss Universe—*wasn't* being obtuse. 144/ Because Trump did NOT then plan to forbid his children from pursuing foreign deals when he became president, Sater's plan made *sense*. 145/ Trump and Putin would get Trump in the Oval—by unstated (we now know hacking) Putin help—and Trump's kids would get Trump Tower Moscow. 146/ On the back end of his presidency—once out of office—Trump would get to enjoy the deal he originally was promised on November 9, 2013. 148/ Michael Cohen now says Sater only meant that a Trump Tower Moscow deal would "engineer" a Trump presidency by making Trump look good. 149/ In Cohen's—absurd—telling, Trump announcing mid-campaign he'd have a new tower up in Moscow by 2018 or 2019 would "engineer" a win. 150/ In fact, Cohen's role in Sater's Russia policy-for-Trump Tower Moscow deal was much more substantial than receiving emails from Sater. 151/ Indeed, shortly after Trump took office, Sater and Cohen coordinated to get a Putin-approved Ukraine deal to Mike Flynn and then Trump. 152/ It's no coincidence at all that the two men working together to revive the 2013 Trump Tower Moscow deal in '15 were back at it in '17. 154/ Flynn being key to *this* Trump-Putin backchannel *and* Kushner's from December 2016 underscores *why* Trump didn't want to fire him. 155/ It also underscores why Trump almost rehired Flynn—despite the international scandal it would've caused—just 48 hours after firing him. 156/ And it puts into perspective why Trump Obstructed Justice to try to get Comey to drop the Flynn case, then fired him when he wouldn't. 158/ Cohen now claims—per usual for him, incredibly—he took Putin's peace deal from Artemenko but *never intended to do anything with it*. 159/ He also—accidentally—revealed it was "one or two pages" in length, despite *also* saying that *he never opened the envelope it was in*. 160/ He also—once again, INCREDIBLY—says his pal Sater never TOLD him he'd be meeting with a man then running for PRESIDENT OF THE UKRAINE. 161/ Cohen and Sater have known each other DECADES; there's no reason to think—Sater's emails attest to this—they play coy with one another. 162/ So Cohen is duping the media—and it's working—into thinking the 2013 and 2015 Trump Tower Moscow deals were entirely separate affairs. 163/ In fact, the evidence confirms that it was ONE deal—and that ONE deal was negotiated by Trump personally in November of 2013 in Moscow. 164/ To hide this, Cohen is now telling some WHOPPERS about his conversations with Trump on Trump Tower Moscow. They're actually hilarious. 165/ Keep in mind Trump Tower Moscow is a) Trump's life ambition, b) was already negotiated for $2.4 billion in 2013, c) Trump's deal-baby. 166/ Trump literally spent the years from 2002 to 2013—at a bare minimum—trying to get to Putin to make his first Russia deal a possibility. 167/ The evidence suggests that, as Sater wrote in a private email to his pal Cohen, Trump Tower Moscow was KEY to Putin helping Trump win. 169/ As if that howler wasn't enough, Cohen—the point man on Trump Tower Moscow in 2015—*also* pretended not to know who Dmitri Peskov was. 170/ Peskov, Trump's top lieutenant, is the *one* person you *had* to go through in 2015 if you wanted Putin to give you a permit to build. 171/ Cohen saying he barely knows Peskov is is like Trump saying he barely knows Tiffany or—as he did say, perjuring himself on video—Sater. 173/ The president knew he was committing a felony, and knew he was doing it on video, but also knew Trump Tower Moscow was heating up then. 174/ If Trump hadn't lied on November 5, 2013, days later Russians might've heard whispers Russia was being dragged into a Trump civil suit. —because he did it *on video*—was done to protect Trump Tower Moscow. 176/ Don't forget Cohen's lies on all this. Don't forget that—per Steele—Cohen and Peskov were the TWO POINT MEN on the Trump-Putin accord. 177/ So if Cohen's and Trump's lies seem brazen, realize that it's because we're down to brass tacks now: if they're caught, it's ballgame. 178/ Was Cohen writing Peskov in January '16 about getting a permit for Trump Tower Moscow? Yes. Because Putin had reneged on the 2013 deal. 179/ Trump admits he didn't think he'd win—so Cohen didn't either. Team Trump hedged bets—seeking Trump Tower Moscow WITHOUT the presidency. 180/ Peskov—who's repeatedly lied since the Trump-Russia scandal broke—may well *not* have responded to Cohen, because Putin didn't need to. 181/ What was called for, in January 2016, was Trump making clear to Putin he intended to run a winning campaign that was Russia-friendly. 182/ That's why within 60 days of Peskov blowing off Cohen, Page was hired—and Papadopoulos; and Manafort; and Richard Burt as speechwriter. 183/ As I've indicated in many other threads, all these hires were inexplicable from the standpoint of credentials or conflicts of interest. 185/ These hires assured Putin Trump would EARN a Trump Tower Moscow via his policy—and the Russian oil-and-gas money men they had a friend. 188/ Who directed the June 9 meeting be set up? Agalarov, on Putin's orders. Who was there? Trump's then-point man on Russia deals, Don Jr.
189/ Who was the guy arranging the meeting? Emin's manager, who partied with Trump and Aras in Moscow in 2013 and Aras says he doesn't know. 190/ Kushner was there because he was working on a new Trump-Putin backchannel after the Cohen-Peskov fail (Flynn helped him out, later). 191/ Manafort was Putin's assurance Trump would stay on track—he set up the Mayflower event with Jared so Trump/Sessions could meet Kislyak. 192/ The Mayflower event Manafort—and Burt—had set up 60 days earlier was where Trump promised Putin—via Kislyak—a "good deal" on sanctions. 193/ And Aras' continued involvement in Trump's life, carefully arranged by him and Emin, assured Trump that Trump Tower Moscow wasn't dead. 194/ Emin tells interviewers he sees Trump regularly, speaks with Don on the phone regularly, and in general is still *very* close to Trump. 195/ The message is clear: the November '13 accord Trump reached with Putin's agents, reaffirmed at the Mayflower in '16, is still in place. 196/ Putin gets the unilateral lifting of sanctions Trump plotted on taking office and a friendly voice—eerily unflinchingly friendly—in DC. 197/ Trump gets Russian enrichments while in office—see Steele's dossier on the December '16 Rosneft deal—and eventually Trump Tower Moscow. 199/ What's perfectly clear, now, is the Trump-Russia scandal began in earnest the *moment* Trump corruptly gave Russia the 2013 MU pageant. 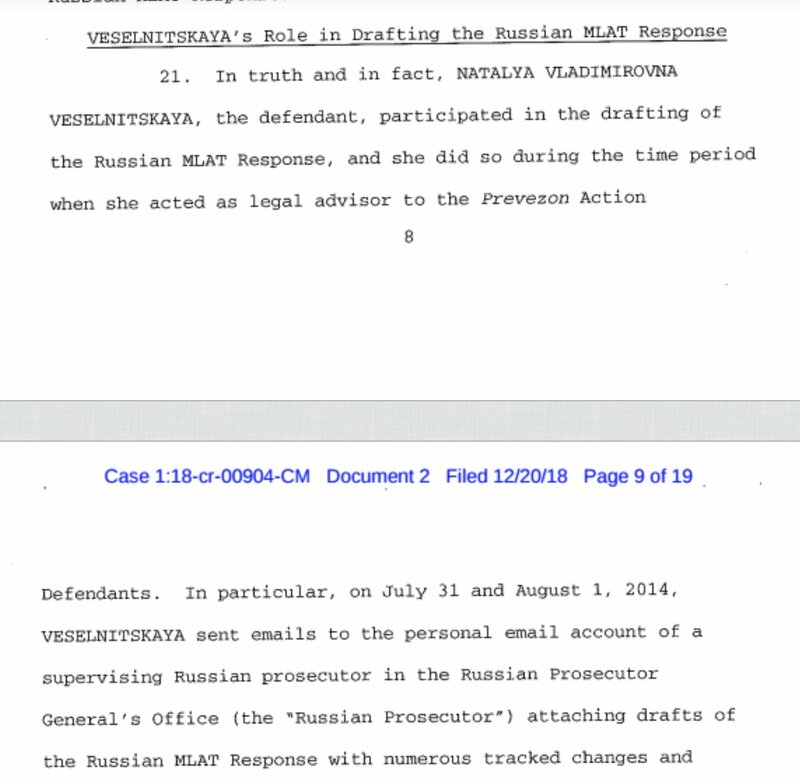 PS1/ I want to emphasize how key Papadopoulos was to this. He said he had ties to "Russian leadership" and Putin wanted to meet Team Trump. PS2/ So was Putin going to have Peskov give *permits* to Donald Trump, risking that all Trump wanted was his tower, not the presidency? No. PS3/ But did Putin want lines of communication? Yes. So he used allies and, on Trump's side, Papadopoulos. In December 2016, he used Gorkov. PS4/ In January 2017, he used Artemenko. In the Summer of 2016, he used Kislyak via Sessions and Manafort (at the RNC and Sessions' office). PS5/ Recent reports suggest that Rick Dearborn's "West Virginia contact" was another Putin attempt to find the right Trump-him back-channel. PS6/ But the one thing that NEVER happened, with these many back-channel attempts, was Putin agent Agalarov calling Trump Tower Moscow dead. PS7/ When did THAT happen? When the Russia scandal had blown up to the point that Putin had to publicly withdraw from all Trump connections. PS10/ In other words, like many of Trump's business deals, his accord with Putin is turning out to be an unmitigated, destructive disaster. If Cohen cancelled Trump Tower Moscow in early 2016, why did Trump's business partner think it *active* long after? 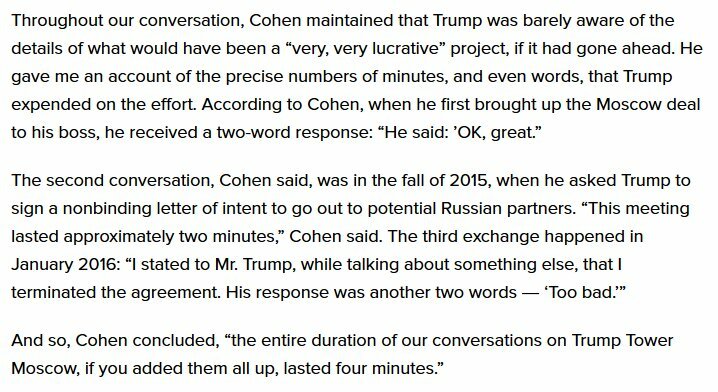 2/ Is it because the active deal was negotiated *by Trump*, and Cohen needs to *pretend* he was working a deal Trump had nothing to do with? 3/ *Don't be fooled*: the facts show Trump was in a business deal with Russia from the time he was exploring a run through the inauguration. 4/ And the deal he was in was with Putin's *official real estate developer*, who has said in interviews he takes deals *on Putin's orders*. 5/ The deal was *personally negotiated* via Putin's permits man, Vladimir Kozhin, and the Putin agent running Russia's state-owned Sberbank. 6/ These 2013 negotiations, which Trump *directed*, give the lie to Cohen's wild claim Trump was disinterested in Trump Tower Moscow in '15. This is not the central question of the Mueller investigation, as saying so raises the bar for Mueller's work *considerably*—forcing him to show that Trump entered a conspiracy with Russia so early that he was legally an *agent* of Russia (working "on behalf of Russia") pre-2015. 2/ Rather, Mueller's brief is to determine if there was coordination between Trump or his campaign and the Kremlin before, during, or after the 2016 election—which covers all *sorts* of activities (including criminal activities) that fall short of "[working] on behalf of" Russia. 3/ For instance, if Trump conspired with the Kremlin, or aided/abetted the Kremlin, or solicited assistance from the Kremlin, or helped hide Kremlin crimes, or tried to obstruct investigation into those crimes, those acts would all be illegal even if Trump wasn't a Kremlin agent. Wittes here catches up to what many of us have said for two years: Trump's obstruction was collusive. But it's not an either/or: the evidence tells us there was also pre-election collusion. 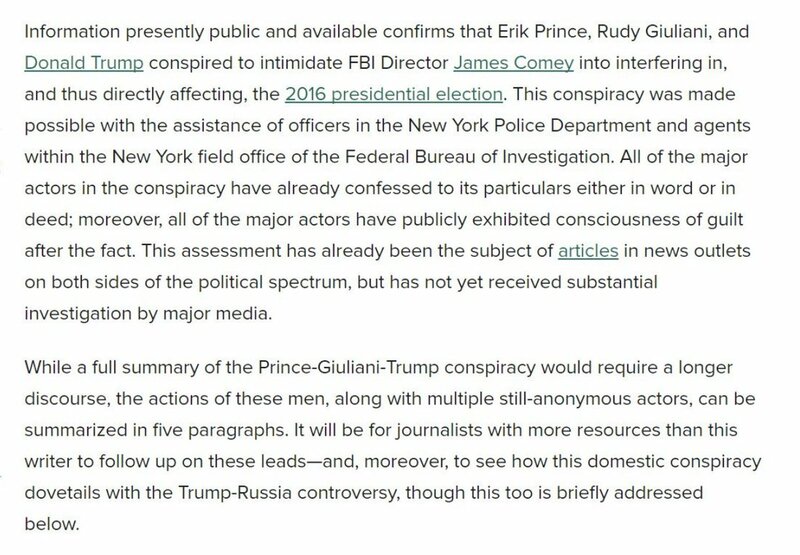 2/ Most Americans have heard of the idea of committing a crime "after the fact"; most Americans know that part of a conspiracy is the cover-up; most Americans know that Trump has deliberately taken actions that benefitted the Kremlin by making its actions harder to detect/punish. 3/ By way of (only one) example, I began discussing "aiding and abetting" well over a year ago. @realDonaldTrump hearings on the results of a federal corruption investigation into the non-profit. In January 2018, the US Justice Department has begun an investigation into whether the Clinton Foundation conducted “pay-to-play” politics or other illegal activities during her tenure as SOS. 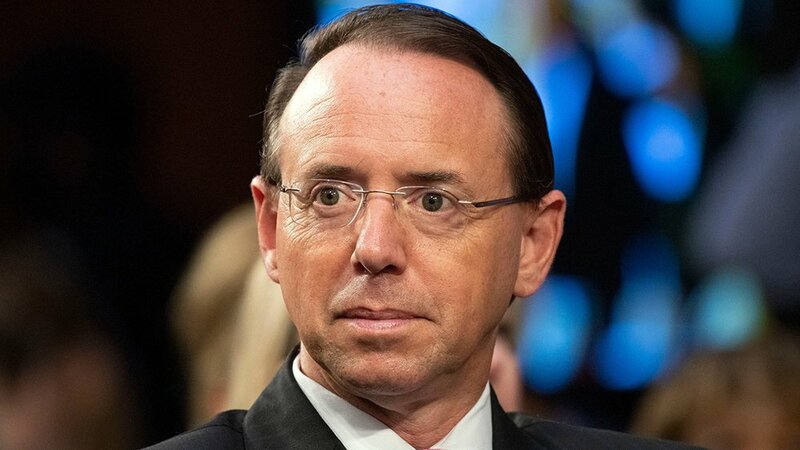 @realDonaldTrump Democrats have accused Republicans of launching a spurious investigation of Clinton to divert attention from special counsel Robert Mueller’s investigation into possible collusion between President Donald Trump’s election campaign and Russia. 2.Publicly known is that #Trump has tried to build #TrumpTowerMoscow for 30 years, #Trump believes that #Moscow one of the hottest places for investments, and that #Russia is nuts for him. 1) This is my #Qanon thread for posts from February 5th to the present. The theme of this thread is the transfer of wealth of the puppet masters. 2) #Qanon begins with a screenshot of a tweet by POTUS responding to a tweet from Adam Schiff. #Trump accuses @AdamSchiffCA of being a liar and a leaker, on par with James @Comey, @MarkWarner, @JohnBrennan & James Clapper. 3) #Qanon says Trump's BLUNT statement was made because damaging information is about to come to light. It involves Shiff, but t also the puppet masters: the Rothschilds, Prince Alwaleed (Dopey) and maybe even George Soros.